Start your adventure off the pavement and into a private ranch! As you ride through the pastures, take in the beautiful landscape! 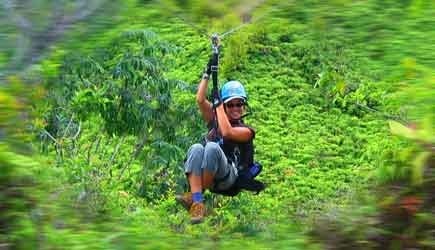 ... Two exhilarating ziplines that will soar you above the jungle! Breathe the fresh mountain air from up there! Jump, swim, or relax on a float at the twin waterfalls! 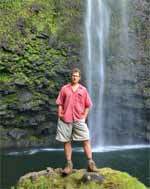 Princeville Ranch Off Road Adventure offers an exhilarating experience on their private ranch. Soar above the trees on two ziplines, hike to a beautiful waterfall for a swim, and enjoy a picnic! First you will take off in their vehicles, and drive to spots that have never been accessible before. As you roll through pastures and forests to historical locations, you will drive through fun dips, turns, and climbs! At your first destination, you will have one of the most breathtaking and panoramic sites on the north shore with 360 degree view of the mountains, valleys, and ocean. After taking it all in, you will hike through the forest to a valley where two ziplines await you. You can zip or watch and cheer on your friends! You will continue through the forest to a secluded twin waterfall where you can swim, jump or float in an inner tube. As you relax or splash around, your guides will prepare you delicious picnic. Wrap up your adventure with one final ride across their working cattle ranch! Most vehicles hold 4 guests. A $159 per solo driver upcharge applies to parties who request additional drivers in a vehicle without any paying passengers. Schedule: Currently tour times are 8am and 1pm. This tour operates 7 days a week during peak season (summer, holiday weeks, spring break). Closed on Sundays during the rest of the year. Reservations: Advanced reservations are required. When you reserve the Princeville Ranch Off Road Adventure on our website your reservation will be guaranteed on your credit card. For most parties a 20% deposit will be charged just a few days before you leave home for Hawaii. The balance is paid when you check in for your tour. FOR PARTIES OF 6 or MORE the 20% deposit and the 80% balance are charged when your reservation is made. Requirements: Close-toed shoes are required (sneakers, hiking boots, hard-toed sandals). No “5-finger” toe shoes, aqua socks or Crocs allowed. All-terrain, hard-toe trail sandals can be rented at $5 a pair. What to Bring & Wear: Wear light and comfortable clothes that can get wet or muddy. Shorts (mid-thigh or longer), T-shirt, sneakers, hard-toed hiking sandals or hiking boots. Wear a swimsuit beneath your clothes for swimming at the waterfall, sunscreen, sunglasses & hat, mosquito repellent, towel & rain poncho, drinking water (32 ounces per person). Backpacks can be rented for $5. Cancellation Policy: In addition to our normal 48 hour cancellation notice policy, they require a 72 hour notice of cancellation for groups of 6 or more. Restrictions: Minimum age 5. No neck or back injuries or pregnant women. To zipline (optional): must weigh between 50 and 280 pounds. Not afraid of heights. Driver minimum age 18, and driver minimum height is 5’4”. At check-in, each Driver must present a valid driver’s license & a credit card that will be kept on file until the vehicle is returned in acceptable condition. Any damages to the vehicle will be charged to the credit card on file upon return of the tour. Princeville Ranch Adventures operates 2 other tours that include zip lines.The Jungle Valley Adventure includes kayaking, hiking and two zip lines and is family friendly- with a minimum age of 5. The Ride N’ Glide combines horseback riding and 3 fun and fast zip lines. For more information see our Kauai Combo Tours or Princeville Ranch Stables. 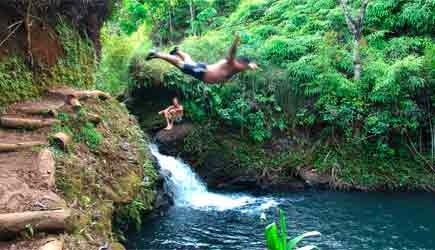 Jump into a fresh swimming hole! Princeville Ranch Off Road Adventure is available for Pride of America cruise ship guests on the afternoon (1pm) of your first day in port. 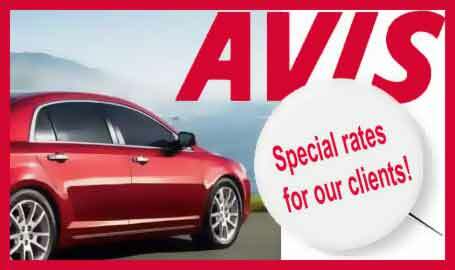 A drive of about an hour is required, and we can arrange a rental car for you. Princeville Ranch is a gem of a location on the north shore of Kauai. With breathtaking views of Namahana, exhilarating waterfalls, exotic tropical jungles … the ranch is a great place to spend a day of your vacation. This is a working cattle ranch, and they got started in tourism offering horseback rides. Then they put in a terrific zipline course. Their latest offering is this off road ATV tour, and it includes elements that make this MORE than just an ATV tour. They take the excitement up a notch by offering two zipline rides during the tour, and include time to swim and jump and float at one of their waterfalls. The zip lines are optional on this tour … if you are afraid of heights or fall outside of the height/weight guidelines you are welcome to just watch (and cheer) those who are screaming and flying through the jungle. No price adjustment is made for folks who don’t do the ziplines. It’s just there as an included option for those who are able (and wanting) to participate. Most of their vehicles hold up to four. If you are a party of four, you can all go together in one vehicle and you will pay one driver rate and three passenger rates. OR you can split up into two vehicles and pay for two drivers and two passengers. You could even take three vehicles, and have three drivers and one passenger. BUT in this case there is an upcharge for drivers who are alone in a vehicle. Solo drivers pay the driver rate plus the rate of a passenger ( even though all the other seats are empty). One other thing to keep in mind when deciding how many in your party want to drive … Princeville Ranch doesn’t allow switching drivers during the tour. Whoever is driving the vehicle at the beginning of the tour is the driver of that vehicle for the duration of the tour.